The Yale University microprobe facility houses a JEOL JXA-8530F (FEG) "Hyperprobe" - electron probe microanalyzer (EPMA; aka electron microprobe analyzer, EMPA) - installation of which began in April 2009. 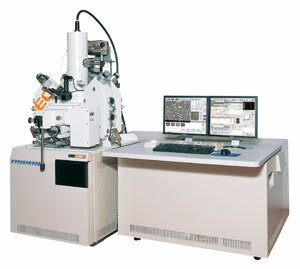 This EPMA/SEM functions with state-of-the-art imaging, analytical, and computer-control capabilities. This probe configuration includes five wavelength-dispersive spectrometers (WDS) and a light-element-capable energy-dispersive spectrometer (EDS) with Windows-7 processing software. Hardware and software allow automated operation and data collection, and software accommodates advanced image processing and feature analysis. Additional instrumental details can be accessed here. This lab also includes a turbo-pumped Emitech carbon evaporator/coater, which also includes metal evaporation capability. Jim Eckert is available to answer questions and assist users with all forms of analysis. For information on instrument access, click here. Current hourly usage rates are available here. We invite your interest in our electron microprobe/SEM facility. For more information, please contact Jim Eckert. With this system we are able to acquire data with the native JEOL interface. We also can acquire WDS quantitative and qualitative/wavescan data with the Probe-for-EPMA software (probewin.exe) we used previously with the JXA-8600. Qualitative and semi-quantitative microscale chemistry can be assessed rapidly using EDS spectrometry. This can benefit phase identification and recognition of compositional variability in a sample. This allows rapid imaging and compositional mapping, as well as storage of images and data in readily transferable formats. With either the native JEOL acquisition software or with Probe for Windows, we also can accommodate integration of EDS data into the quantitative-analysis package. Quantitative analysis can address all elements heavier than beryllium (boron and higher). Each analysis takes several minutes to count the X-rays and perform related calculations. Ultimate WDS detection limits for sodium and heavier elements are about 50 to 100 ppm (0.005 to 0.01 wt%, elemental); for lighter elements, the instrument is somewhat less sensitive. For most major elements, these truly quantitative microscale chemical measurements typically have accuracy and precision on the order of 1%. Comprehensive setups applied heretofore include a 33-element oxide setup, incorporating all REE with overlaps and interferences. Automated analysis allows the operator to assign locations for analysis during a session, then acquire data automatically (unattended) at those stored locations. Thus, the operator may concentrate on other tasks while the time-consuming X-ray counting and data reduction are completed. Data can be transferred via network or USB connections for rapid accommodation into reports and manuscripts. conductive carbon (coating ideally performed in the lab here).